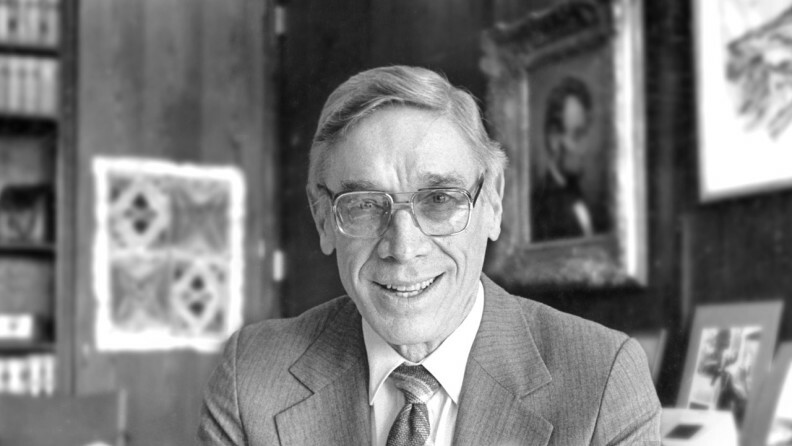 W. Glenn Terrell was dean of faculties at the University of Illinois at Chicago Circle when he was tapped to become the seventh president of Washington State University. The Board of Regents announced the selection at its meeting on February 24, 1967, in Spokane. Born May 24, 1920, in Tallahassee, Florida, Terrell earned his bachelor’s degree in political science at Davidson College, his master’s degree in psychology from Florida State University, and his Ph.D. from the University of Iowa. He taught psychology at Florida State and the University of Colorado before becoming dean of the College of Liberal Arts at UICC, a post he held until becoming dean of faculties there. Terrell took office at WSU on July 1, 1967. During his first semester, he began earning his reputation for cordial relations with the faculty but also his reputation as “the students’ president.” He frequently walked to work from the president’s house on the west side of campus to his office on the east side, stopping to visit with students, faculty, and staff along the way. In the academic realm, Terrell was devoted to improving the quality of undergraduate education at WSU as well as expanding research and graduate education. Areas of emphasis ranged from veterinary medicine to biological sciences, nursing, the humanities, and social sciences. He also emphasized efforts to attract outside funding for university research and research facilities. The years of the Terrell presidency were times of change and turmoil for the nation, including activism on the Pullman campus related to the Vietnam War, racism, and feminism. Terrell is considered to have handled well the difficulties of that era, including the student strike in 1970 following the killing of four Kent State University students by Ohio National Guardsmen during antiwar protests. Ethnic studies programs and the Commission on the Status of Women were established during this time as was the Office of Ombudsman, a place where concerns of students, faculty, and staff could be addressed confidentially. Increasing support from varied sources was a priority for Terrell. During his years, research grants and contracts grew from $11 million in 1965-67 to $68.5 million in 1983-85, a reflection of the growing emphasis on faculty research and scholarship. An able partner in advancing the University’s academic quality and research was Albert C. Yates, executive vice president and provost. Another influential development during Terrell’s years was the establishment in 1979 of the WSU Foundation to increase private support for the University. Enrollment grew substantially during this period, from 10,500 students the year before Terrell arrived to 16,500 in 1984-85, the academic year in which he retired. Approximately one-third of all WSU graduates up to the 1985 commencement had their degrees awarded by President Terrell. To keep up with the growth of student enrollment and research, WSU built many new buildings, including the Beasley Performing Arts Coliseum, named for Wallis Beasley. Terrell was respected nationally for his leadership, serving on the board of the Western Interstate Commission on Higher Education, or WICHE, and as the elected president of the National Association of State Universities and Land-Grant Colleges. In recognition of his service to WSU, the University established the endowed Glenn Terrell Presidential Scholarships for high-ability students, recognizing both his commitment to students and his role in starting the WSU Foundation. The University also named the area in the heart of the campus the Glenn Terrell Friendship Mall and the new library adjacent to Holland Library as the Terrell Library.